Dacia's gift tag swap. The details, type inkjetted onto fabric, then ironed on double sided interfacing and backed with different fabrics, cut out by hand and ribbon added. Should be noted if you receive one of these you can write on the fabric, just might need to use a permanent pen. I'm sort of happy with these, not quite the vision I had imagined. 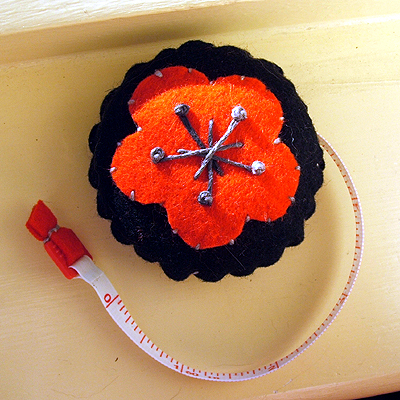 More felt magnets and a felt tape measure off to various locations. 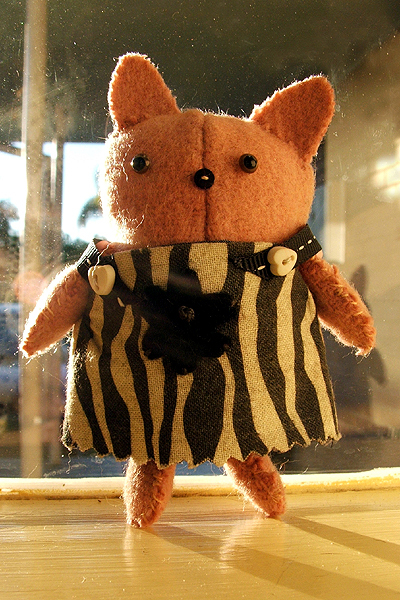 Zebra kitty....more inkjetted fabric, dress lined with steel grey silk, body wool blanketing. 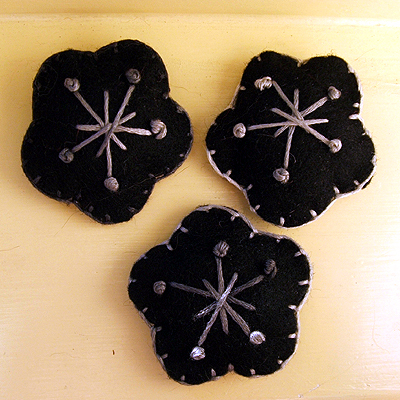 Felt accessory on dress, off to someone, somewhere.....Did you see Lisa's reopened her online store. Lovely, lovely stuff. I've also been playing with fabric for jewellery making. I'm all about textile accessories at the moment. I'll post hopefully later this week with some mixed results. EDIT - Oops forgot to include Zebra kitty, here she is, excuse the dusty, dirty window. The tags are magnificent, absolutely! The felt goodness is super good. Little kitty is lovely. And I am so inspired by your creations and blog on an ongoing basis (thanx bunches!). what gorgeousness nic, looking forward to more info on the inkjetting onto fabric?!!! If I was you I would be very, very happy with those tags. They are fantastic. "Did you make this? You're so clever!" Wow, those tags are fantastic - I love them. And zebra kitty looks like such a character hanging out on the window sill. I agree, Those tags are amazing! Very clever! Oooh, I can't wait! Love the Zebra Kitty too. Very sweet. 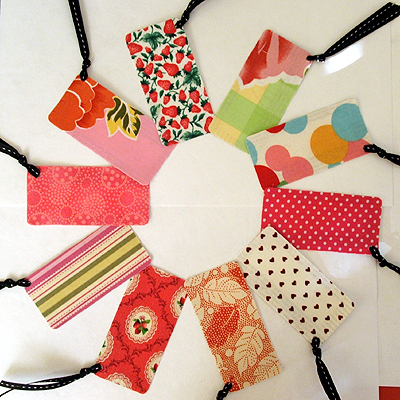 I think those tags look fabulous. I've seen some of the others too on various blogs and you've all done a great job. It's a great idea for a swap. your tags are fantastic... *love* the text! and zebra kitty? wild... completely wild! Oooh! LOVE those tags. I'm in Dacia's swap too. I sure would feel lucky to get my hands on one of those! Wow, it all looks great! I love the tags, especially the strawberry one. Also Zebra Kitty is great! Oooohhhh -- the text on the tags is BRILLIANT. How clever are you! I love your tags! I am going to have to stop peeking - but really I can't. Great job! Yowza, love those tags! I am also participating in Dacia's swap, I hope one of yours in my bunch. 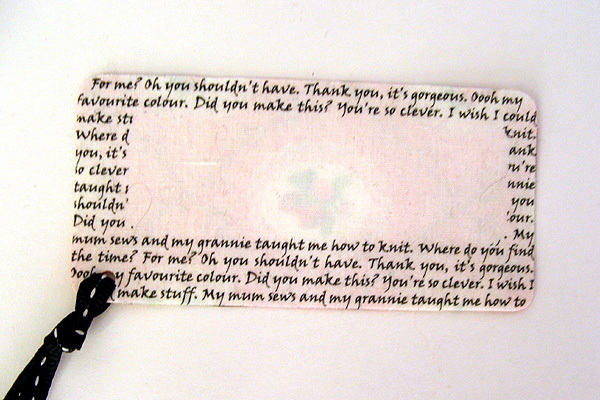 I'm a novice to sewing; long term knitter and would love to make some of the lovely gift tags. Can you possible show more pics? or provide more details so I can attempt this wonderful project.